With the new generation of ATEX IECEx Operator modules and Transceiver, JAY Electronique offers innovative wireless solutions for potentially explosive areas. 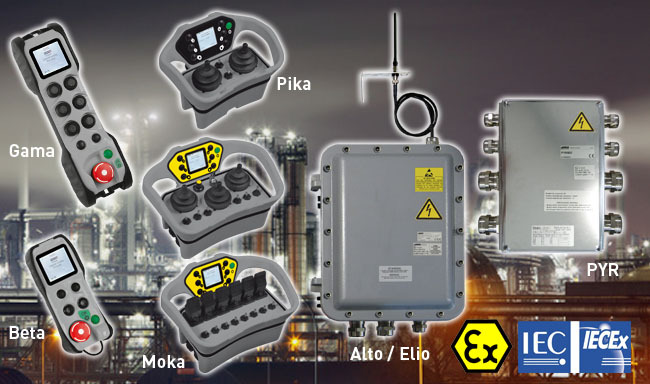 The ATEX IECEx Operator modules "Pika" and "Moka" with proportional levers and joysticks, and "Beta" and "Gama" with push-buttons are designed for use in potentially explosive gases atmospheres classified 0, 1, 2, dust atmospheres classified 20, 21, 22 and mines. The ATEX IECEx Transceivers "Elio" and "Alto" are designed for use in potentially explosive gases atmospheres classified 1, 2, dust atmospheres classified 21, 22 . A connection interface unit "PYR" ATEX IECEx can be added to the radio solution.